Henrietta gave birth to a shiny new baby boy early this morning. He just missed sharing a birthday with me by a few hours. 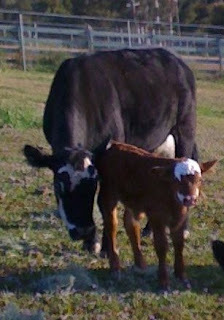 He looks a lot like his daddy, Lucky, who is a purebred Hereford. We're so proud. Mommy and baby are doing fine. We're expecting a few more brothers or sisters to arrive soon.